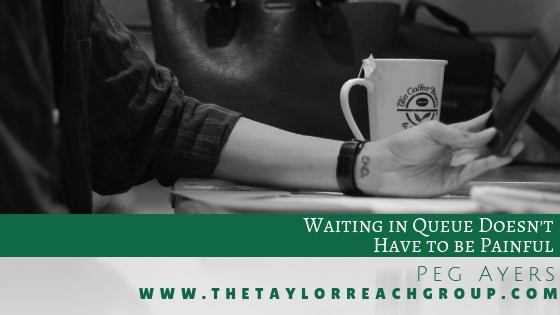 Waiting in Queue Doesn't Have to be Painful | The Taylor Reach Group Inc. When my father passed away, I spent hours in queue, waiting for help from a variety of companies and agencies that should be providing service to those who call. In fact, they did all eventually provide the required service (except for one government agency that proved so difficult to reach, I gave up and visited them in person!). I spent much of that hold time compiling my list of queue time grievances. Stop Telling Us We’re Important! How many customers are yelling at the phone at that point? “If my call was really important, you’d have enough people available to answer it! And, how else would you answer my call but in the order it was received?” In fact, calls may be prioritized in many ways, like annual spend, loyalty status, recent catalog receipt, etc., but even companies who do all that still tell customers their calls will be answered in the order received. Callers may have believed you thought their calls were important when the phrase was first used, but now it’s just empty words. Get enthusiastic voice talent to create a clear “Thanks for your call!” greeting, cover the “your call may be recorded” line quickly, and move on. If there’s one primary language among your callers, make it the default language for your Interactive Voice Response System (IVR). Quickly offer the option for other languages in those languages, then leave everybody else in the queue for the primary language. You can even use country or area code of the caller to determine the default language and offer the others as options. If you can tell a caller how long they’ll be waiting, and then meet or beat that estimate, that’s a big customer satisfier. Those who don’t have time to wait will call again later, and you’re meeting the expectations of those who choose to hang on. The government agency I chose to visit in person was one who told me how long I’d be waiting. I made several calls, and they gave me a one hour estimate each time. I wonder if they don’t have software that estimates wait time at all—maybe they just tell everybody one hour. I tried to wait, but something always interrupted me before the hour was up. Despite having already set this, admittedly low, expectation, they then interrupted the hold music every 30 seconds to tell me they were sorry I was waiting or to encourage me to go to their website. Obviously, if I could have done that and accomplished my purpose, I would have done so. Once you’ve mentioned the website a time or two, let it go. And if the wait time is generally long, don’t stop drawing attention to it by apologizing. I was multi-tasking during my wait time, as most people do, and I found the ongoing “Sorry for your Wait” messages a complete distraction. You should call your own number and wait in queue on a regular basis. Make sure your voice talent comes across as sincere, your IVR prompts are clear (and go where they should!) and your hold music and messages are all high-quality recordings. Scratchy music sets people’s teeth on edge, and that’s the last thing you want to do right before your customer reaches your agent. One well-known shoe company offers an optional joke of the day when you call, but this great idea is ruined through poor execution because the sound quality is so poor. In perhaps a dozen calls in the past few weeks, I’ve dutifully entered account numbers, postal codes, phone numbers, and a variety of other numbers, only to be asked for them again by the agent who eventually answered the call. If you can’t use the information, don’t ask for it. If you’re using it to route your calls, make sure it’s accessible to your live agents. No matter what business you’re in, it’s better if your callers are calm when they reach your live agents. If you aggravate them while they wait, they will take it out on your agents, resulting in higher handle times, greater customer defections, and decreased employee satisfaction, which leads to higher employee attrition. These are all real costs you can avoid if you just follow these tips and regularly put yourself in the shoes of your customers. Follow Taylor Reach and Peg Ayers on Twitter at @Taylor_Reach and @ayers_peg. To find out more about how Taylor Reach can help your company with IVR and queue time, CLICK HERE to schedule a free consultation. Is It Time for Your Contact Center Check Up? Want a Better Customer Experience? Ask the Front-Line!